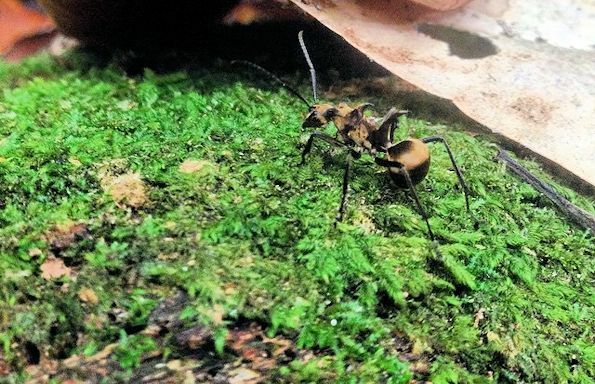 A study by the University of Liverpool, in collaboration with the Natural History Museum, has found that ants are responsible for moving more than half of food resources from the rainforest floor, playing a key role in maintaining a healthy ecosystem. The rest of the waste was removed by all other animals combined, including mammals, birds and other vertebrates and invertebrates. Resources and waste which ants remove include dead animal bodies, seeds and fruits. Liverpool ecologist, Dr Kate Parr, said: “The movement, consumption and recycling of dead organic material in ecosystems is important because it facilitates nutrient redistribution and decomposition. Because ants collect waste products and take them to their nests, they create hotspots of nutrients where plants and microbes thrive; this maintains a diverse and healthy soil. The study showed that in the absence of ants no other animals can compensate for this role. Therefore, if ants weren’t carrying out waste removal, dead organic material would build up and decompose more slowly in situ creating a more homogenous, less diverse soil environment. Lead author of the study, Dr Hannah Griffiths, also with the University’s School of Environmental Sciences added: “This work is important because tropical rainforests are some of the most threatened ecosystems on the planet, losing species at an alarming rate. The paper `Ants are the major agents of resource removal from tropical rainforests’ is published in the Journal of Animal Ecology (doi: 10.1111/1365-2656.12728).